While you are enjoying the Easter weekend, I have a FREE egg related kids book for you – Terry Treetop and the Lost Egg is a picture book for kids age 2 to 6, a story about eggs. It has print version and Kindle version. The Kindle version is FREE today. It is a nice little treat for the egg hunting weekend. If you have not downloaded the free Kindle app, you can find a review and download link at iGameMom’s article How to read Kindle books without a Kindle. If you would like to download the free book, make sure to have the Kindle app and a Kindle account ready first. It will make the process a lot smoother. The book Terry Treetop and the Lost Egg is part of a Terry Treetop series. A boy, Terry Treetop, found an egg while camping with the family. He was determined to take the egg to its mother. Along his search, he talked to turtle, frog, alligator, and other animals, they all explained to him why it was not their egg. Did Terry Treetop find the egg’s mother? Can you guess who? It is a lovely story. The main character, Terry Treetop, is a caring and positive boy, a good role model for preschool children. 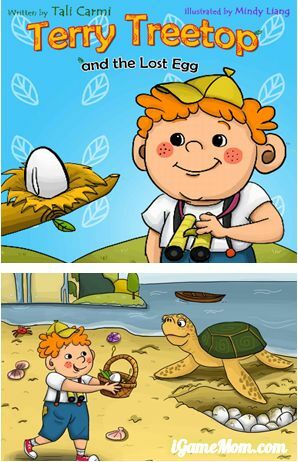 Along the story, kids also learn about different animals and their eggs and babies. The illustrations are adorable with pleasant colors. The story is told in rhyming style, making it a good read aloud book for the family to enjoy together. If you are reading it with Kindle, you can download a free coloring page following the instructions at the beginning of the book. I found if you put your device horizontally, you can see the picture and all the text for that picture on the same page, which will make the reading experience a little smoother. However, if you prefer a bigger picture, you may keep the device at portrait position. Terry Treetop and the Lost Egg is available on Kindle, it is Free today. You can also have it as a print book. Below, the Amazon link leads you to the Kindle version. If you want a print book, look for Formats below the prices, and click on Paperback.